A freak is someone or something with an unusual physical abnormality, which does not sound appealing in a society so invested in a standard of norms and normal accepted behaviours and thinking. 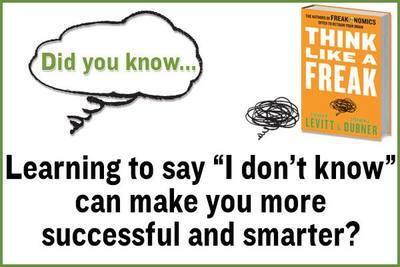 However Steven Levitt and Stephen Dubner wrote a book called “Think Like A Freak” to encourage a new way of thinking and viewing the world. The authors’ argument for “thinking like a freak” involves risk perception and analysis. If you take a risk and do not succeed, you have simply learned from your experiences, and if you succeed, you benefit. At the very basis of the freak premise, is the necessity to acknowledge honestly when you do not know something. This is harder than it sounds to say you don’t know. Our technocratic society puts great importance on scientific and educated, rational, proven knowledge - and to say you don’t know something must mean you are uneducated and inept right? When someone doesn’t know something and is willing to admit that, they are in a better position to ask questions, to try different ways, and to investigate the issue. Many examples of this are cited throughout the book, from real world situations and experiences. This adds an interesting element to the book as the authors use storytelling to describe how one can think like a freak. One of the most thought provoking points the authors put across is on the topic of quitting. This society has so many reasons why people should not quit - why people should keep going, should try harder to solve problems, and to never give up. This view is challenged soundly in the book by discussing how thousands, if not millions of dollars are wasted in enterprises which would better off being scrapped - and how this does not happen because people have invested so much in said enterprise they are unwilling and unable to see it is more economical to quit sooner than later. My favourite chapter is “Like Giving Candy From A Baby” which discusses incentives and how to design experiments to determine which incentives people want. The chapter starts off with a story about how one of the authors thought he had solved a toilet learning issue with his toddler by offering candy as an incentive… which of course backfired on him. He uses this anecdote to explain how sometimes incentives will work, but perhaps not in the way we intended them to, while others don’t work and need to be re-evaluated. It is a very interesting and practical chapter on motivation and incentives which many people from managers of companies to teachers and parents would find useful. This is a great book overall and would make a good book club group discussion book.